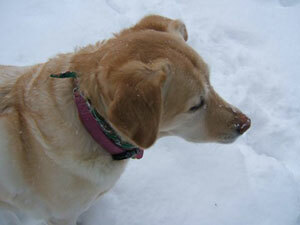 I will never, ever… forget the day that our vet told us that the growth in Emma’s jaw was “cancer”. We immediately refused to believe what she was telling us, this was incomprehensible to us… and could not be happening to our sweet little girl! I spent hours on various websites researching diseases in dogs… cancers, tumors, benign tumors… just looking for anything that would help me to prove to our vet that this wasn’t cancer and that she was wrong. Unfortunately I was wrong… and Ron and I were heartbroken. We followed up with two specialists, we were told that our options were to have her jaw partially removed, this could possibly extend her life by an additional 10-12 months (if we were lucky)… or do nothing and keep her comfortable. We were very concerned about her quality of life. We knew that we would have to help her to eat… this was heart-wrenching to us and knew we couldn’t do it. We would not put her through that, she deserved better and deserved dignity. Her cancer grew rapidly… from the day of diagnosis to the day our vet came to our home to help us say goodbye to Emma… it was 34 days. We kept her pain free as best we could and we knew that she would help us to know when it was time and she did… the morning that she stopped eating we knew. Our wonderful vet came to our home and together we helped Emma to gently, peacefully cross over to the Rainbow Bridge, while holding her tightly in our arms. We started Emma’s Foundation to keep her memory alive… and to also help other dog owners who cannot afford the cancer treatments for their beloved pet. We want to make a difference in the lives of our pets and for the people who love and need them. We know Emma would be proud! 50/50 Raffle will run through Mothers Day 2019, lets sell 2000 tickets this year!!! More to come on this event!!! Keeghan Nolan and other Musicians, 50/50 tickets, raffles etc! Emma’s Foundation for Canine Cancer has been awarded a $30,000 grant from the Petco Foundation together with Blue Buffalo. These funds will be used to provide financial support to pet owners who otherwise would not be able to afford this type of care for their pets. Thank you Petco Foundation and Blue Buffalo for your incredible, ongoing support! "Princess saw the oncologist yesterday for her 6 month follow up exam $ 882.72 and received a clean bill of health -she is cancer free and returns in 6 months 10/21 for followup . I need to win lottery . She passed all the tests and by dieting she has lost 16 pounds she weighed in at 98 lbs . Wanted to keep you updated on her progress and again thank you for all your help"
Emma’s Foundation for Canine Cancer will work to heighten canine cancer awareness, provide resources and to provide financial funding to pet owners who do not have the financial ability to pay for the canine cancer treatment of their beloved pet. 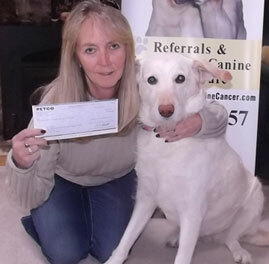 Our focus is on sparing or prolonging the life of our canine friends, by assisting with financial support. Its unfortunate yet comforting that something like cancer can bring people together to do such wonderful things…. Please note that Emmas Foundation is ONLY able to help New England and Florida Residents at this time. To apply for funding, please download and fill out this application OR fill out the form Online by clicking here. Emma’s Foundation is a non-profit organization whose Articles of Incorporation were filed with the state of VT on September 21st 2010, we received our official notice of our 501c3 status with the IRS on February 1, 2011. Our federal tax exempt number is 27-3588308.